I have always loved Pineapple log cabin quilts. 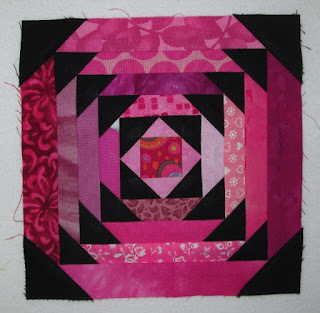 I started to see a few rainbow log cabin blocks over at A Quilt and a Prayer Blog. I just loved what she was doing. I had to make some too. I got two blocks completely done and started two more. It is just so cute. They will finish at 6" and the pink blades are 1/2" finished. I can use the 1" strips or larger. 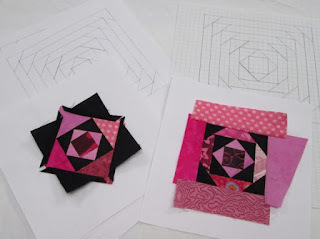 I am also using Black Kona cotton for my triangles. I started by drawing it out on graph paper and making a few copies. It is paper piecing so it goes slowly but wow! Do not forget to check out Soscrappy's link for more pink scrappy goodness. And for more about the Rainbow Scrap Challenge 2013 check out the RSC13 link. Please join in the fun. Next Saturday is the last pink Saturday but you can hop in at any time. Maybe just make one block each month. I have inspired my mom to start. She is sorting her scraps by colour and is planning to do something Rainbow. She travels and her sewing is not so consistent. But I hope to show off some of her blocks now and then too. This week I also got done two Crumb (poverty piecing) block at 6". I did some 4" block last year and man these seamed so big. I had to do lots more work to get the extra 2". I think I like 4" better. We will see if I do this size or go back to 4". Also, I am unsure of the black and white part from a Cat. It sticks out. I got 14 spools done this week. 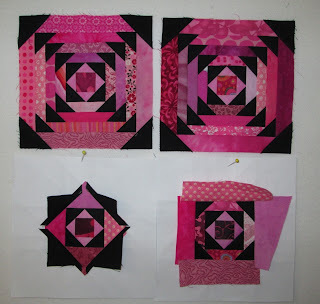 I think I am up to 26 pink spools this month all in Pink. If you do not know about the spools leaders and ender challenge you should go see Bonnie Hunter at Quiltville. I started last them summer. 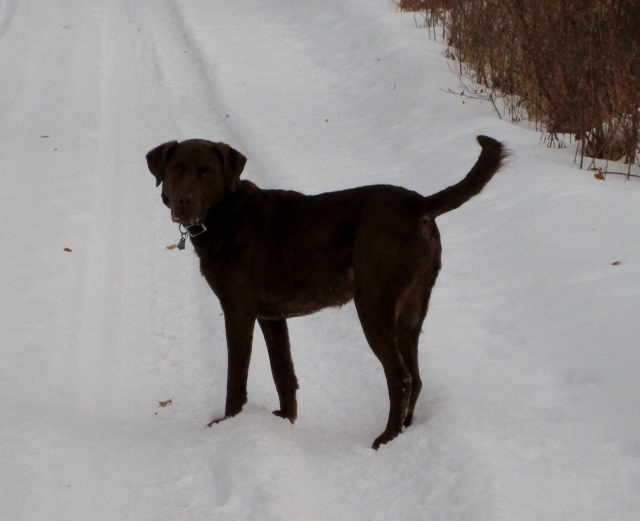 Here is Lex on a walk. Lex and I have had a very busy weekend. First we had a workshop in agility with Kathy Keats Friday night. We just loved it. Then we went to our agility league Saturday morning. And after that we went to Dog Docks for the afternoon dip in the pool. We did three actives in 24 hours and got 6 hours sleep. We hardly had time for eat. I will be going to bed soon. All your pink blocks look great! Hi, Cathy. Sounds like Lex is keeping you very fit! Love all the pink blocks because I've been craving pink. The pineapple blocks are stunning with the black. Cathy, you've been busy, the pineapple are great & I'm impressed with your little strips, that's a lot of work. I really like your crumbs (one of my favorites) and I wouldn't worry about the cat part, I don't even think you'll notice it once all the scrappy blocks are sewn. Thanks for giving the link to Bonnie's leader/ender challenge. 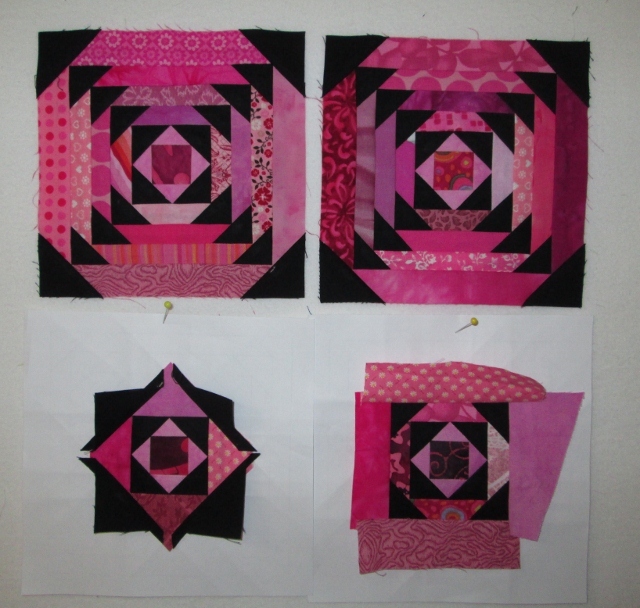 Lovin' those pink-and-black blocks, Cathy! Paper piecing is painful for me; I get everything turned around and it takes me hours just to get piece 1 connected to piece 2...so I will enjoy your pineapple log cabins vicariously! Great pineapple blocks. They do take a long time to make, but what a fun block from the tiniest strips. So fun that you have your mom joining in as well. Great collection of pink and the month isn't over yet. 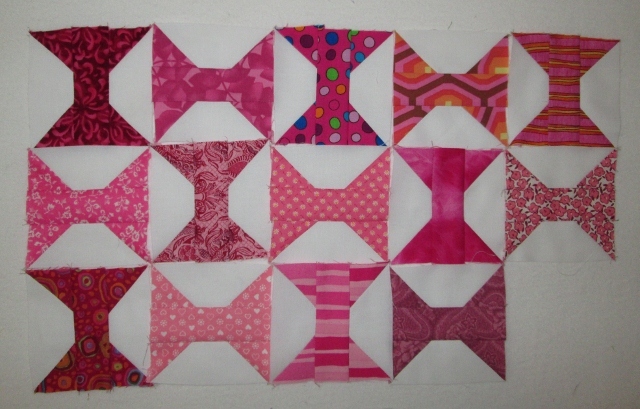 Beautiful blocks Cathy! Love how the black makes them pop. Sounds like a very busy weekend. I hope you can get some rest today. Beautiful pineapple blocks Cathy, I love the addition of black in them! I've got a stash of the leader and enders spools, great idea to do them for the scrap challenge! Amazing pineapples! I will enjoy watching these progress over the year. I enjoy hearing about your activities with Lex - so different from my spoiled dogs! They have been missing their daily walks lately as we have had so much rain. Your pineapple blocks are very striking with the black corners! Love those pink pineapples and I LOVE Rex. So much fun! Love the pineapples...and the spools are just so sweet, I might have to start some! Gorgeous pineapples...and crumbs...oh, and spools! 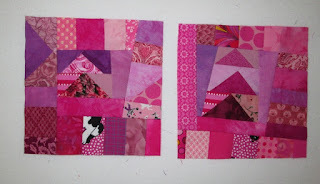 GREAT pink blocks! You have some pretty pink fabrics. 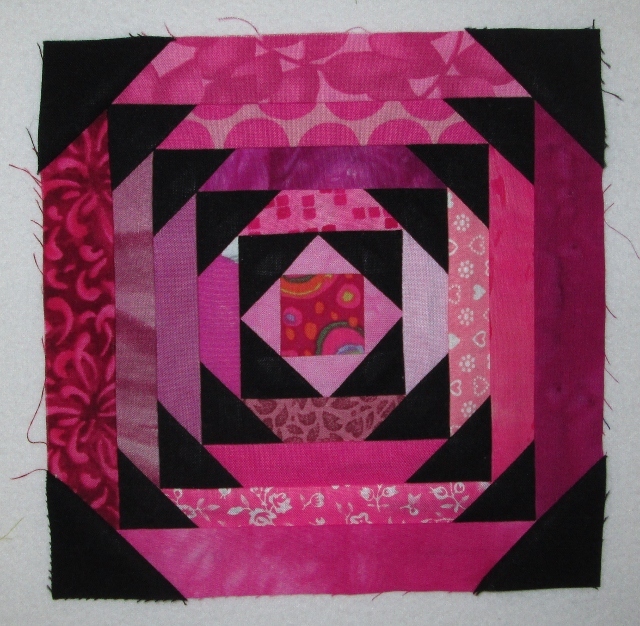 You have some fabulous pink blocks Cathy! Love the Pink with black log cabins! WOW!! One of these days I may have a go at crumb blocks. Your snow dyed fabric looks great! This is not something I've ever tried before apart from dying a sheet one colour to use as a table cloth.